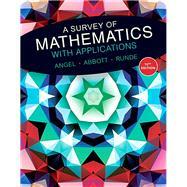 For courses covering general topics in math course, often called liberal arts math, contemporary math, or survey of math. The Tenth Edition of A Survey of Mathematics with Applications continues the tradition of showing students how we use mathematics in our daily lives and why it’s important, in a clear and accessible way. With straightforward language, detailed examples, and interesting applications, the authors ensure non-majors will relate to the math and understand the mathematical concepts that pervade their lives. With this revision, an expanded media program in MyMathLab, and a new workbook further build upon the tradition of motivating and supporting student learning. MyMathLab is an online homework, tutorial, and assessment program designed to work with this text to engage students and improve results. Within its structured environment, students practice what they learn, test their understanding, and engage with media resources to help them absorb course material and understand difficult concepts. NEW! This edition’s MyMathLab course provides additional tools to help with understanding and preparedness. Allen Angel received his BS and MS in mathematics from SUNY at New Paltz. He completed additional graduate work at Rutgers University. He taught at Sullivan County Community College and Monroe Community College, where he served as chairperson of the Mathematics Department. He served as Assistant Director of the National Science Foundation at Rutgers University for the summers of 1967 - 1970. He was President of The New York State Mathematics Association of Two Year Colleges (NYSMATYC). He also served as Northeast Vice President of the American Mathematics Association of Two Year Colleges (AMATYC). Allen lives in Palm Harbor, Florida but spends his summers in Penfield, New York. He enjoys playing tennis and watching sports. He also enjoys traveling with his wife Kathy. Dennis Runde has a BS degree and an MS degree in Mathematics from the University of Wisconsin—Platteville and Milwaukee, respectively. He has a PhD in Mathematics Education from the University of South Florida. He has been teaching for more than twenty-five years at State College of Florida—Manatee-Sarasota. His interests include reading, history, fishing, canoeing, and cooking. He and his wife Kristin stay busy keeping up with their three sons–Alex, Nick, and Max.